This action is used exclusively for image fields in a List Detail View. Capture an image using the camera, or from the photo library. On devices that don't support a camera, select an image from the filesystem. You can build mobile, disconnected applications, that include the ability to capture images using the camera on the device. When running on a device that does not have a camera, the image to use can be selected from the file system. 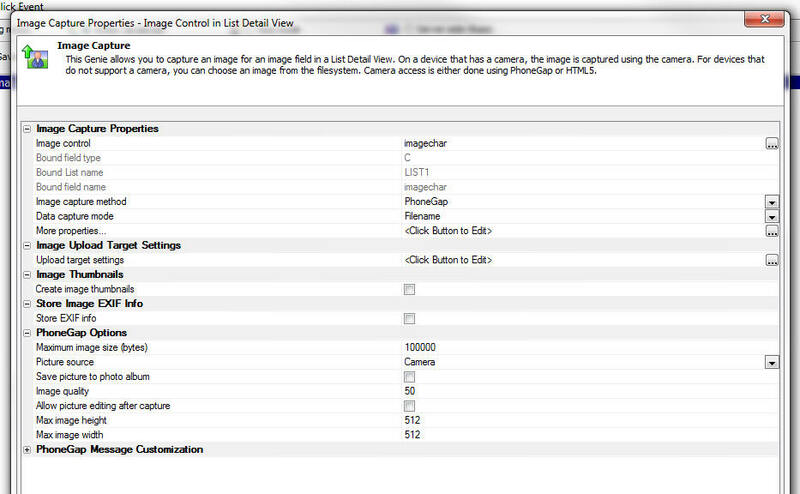 To create a button to capture a new image for an Image control in a List Detail View use the 'Image Capture for List-Detail View - Camera/Photo Library' action. For more information on capturing images in the List Detail View, see Creating Disconnected Mobile Applications and search for 'camera'. a character field that will contain the photo (actually, it will contain the URL that points to the photo - which might be on S3 or on your Alpha Anywhere server). When you are capturing base64 data, the photo field could be a character field, or a binary field. But if you want to use the file system on the mobile device for your photos, your photo field must be a character field. Assume that you have have added a List control that is bound to this table to your UX. The control type for the photo field (imageChar) in the Detail View should be set to Image. First you will need to edit the List control and go to the Fields pane and ensure that the control type for the imageChar field is set to Image. Since imageChar is a character field the List does not set its default type to Image. You should then add a button next to this Image control and set the action on this button to Image Capture for List-Detail View - Camera/Photo Library. Note that the builder has several properties shown as read-only properties. In this example, the target field (i.e. the Bound field type) is a character field. Therefore we have the option of uploading the image to either Amazon S3, or the Alpha Anywhere server when the data in the List are synchronized. Specify the Detail View image control. The URL for the file where the image is stored on a device. This variable is only available if PhoneGap was used to capture the image. If PhoneGap was used to capture the image, the file URL can be used instead of the base64 encoded data to display the image in the app. The latitude where the image was captured. The longitude where the image was captured. The altitude where the image was captured. The date time information for the image. A JSON string with all of the EXIF data returned by the camera. EXIF information is not available if you select a Video from the Photo Library. Read only. The Image control in the List's Detail View is bound to a corresponding field in the List control and this field in the List control is in turn bound to a field in the source SQL database. The data type of this field in the SQL database is a character field. As mentioned previously, you can only use the Filename option for the Data capture mode if the photo is bound to a character field in the SQL database. If the Bound field type is a binary field then uploading the image to Amazon S3 is not an option. The image can only be uploaded to the Alpha Anywhere server. Read only. Name of List control for the data field that is bound to this control. Read only. The name of the field in the SQL table where the image name will be stored when data from the List are synchronized. Read only. Type of the control in the List to which this control is bound. Specify if you want to use HTML5, PhoneGap or PhoneGapPreferred to capture the image. If you select PhoneGapPreferred, the PhoneGap method will be used if the application is running in a PhoneGap shell, but the HTML5 method will be used if you are running in a browser. When an Image file is captured using PhoneGap the captured file in placed in a temporary storage location that could be cleared when the app is terminated. Therefore, it is advisable to move the file to a permanent location. on iOS: 'public' - the application's "Documents directory" - accessible in iTunes file sharing and backed up to iCloud, 'private' - application's private persistent data - deleted when application is uninstalled, 'saved' - similar to 'private', but backed up to iTunes. Choices include saved, private, public. Specify the folder in the file system where the file should be stored. Filename or Base64 - This prompt only appears if the Image capture method is PhoneGap or PhoneGapPreferred. If you want to store photos in the file system on the device you must use the Filename option. Specify if the image should be uploaded to the Alpha Anywhere server, or to a cloud storage provider (e.g. Amazon S3). Upload target settings apply to all image fields in the List (and any child Lists with pre-fetched data that are linked to this List). For example, assume that you have two image fields in your List. You might have one button to capture a photo for the first image and another button to capture a photo for the second image. If both of these buttons are configured to use the Filename option for the Data capture mode, then both of these images will be uploaded to the same target (either the Alpha Anywhere server, or Amazon S3). It is not possible to upload the first image field to S3 and the second image field to the Alpha Anywhere server. (Not necessary if the Upload Target is set to Amazon S3) Allows you to specify the folder on the Alpha Anywhere server where the uploaded images will be stored. Also allows you to specify the name Xbasic functions that will called before and after the file has been uploaded from the device to the Alpha Anywhere server is saved. A typical use case for the beforeUploadedFileSave function is to override the default settings and specify the filename and folder where the file should be stored. More properties... are actually stored in the List control settings. It is merely a convenience that you can edit these setting in this builder. Open the List builder and go to the Field pane to see the settings for each image field. Should the Amazon S3 credentials and bucket be read from a named storage connection string, or do you want to specify explict values for the access key, secret and bucket. Choices include Named Storage Connection String, Explicit. Specify the named storage connection string. The storage connection string MUST NOT BE ENCRYPTED. To define a storage connection string, go to the Tools menu in the Web Projects Control Panel. Specify if the image should be uploaded to the Alpha Anywhere server or to Amazon S3. These settings are stored in the List definition. You can also edit the settings by opening the List builder, going to the 'Detail View' tab and then editing the 'Media and Other Linked Files' property. Allows you to specify if you want to create thumbnails from the uploaded images. You can only create thumbnails if you are uploading to the Alpha Anywhere server. If you are uploading to Amazon S3, then you cannot create thumbnails. Define what thumbnails should be created. The Thumbnail definition is stored in the List definition. Allows you to specify if you want to extract EXIF information from the uploaded photo and store that information in fields in the table to which the List control is bound (the 'target' table). This option is only available if you are uploading the photos to the Alpha Anywhere server. It is not available if you are uploading to Amazon S3. When you turn this option on, the genie allows you to map various pieces of EXIF information to fields in the 'target' table. For example, the target table might have a fields called 'latitude' and 'longitude' and you could map the EXIF latitude and longitude values to the corresponding fields in the target table. There may be quite a bit of data in the EXIF object that is extracted from the uploaded image and you can store the raw JSON string (with all of the EXIF information) in a long character field in the target table. Depending on the mobile device that was used to capture the photo, and depending on the settings on that mobile device, EXIF information may not be available in the uploaded photo. Define the type of EXIF info to store in the database. The EXIF info definition is stored in the List definition. (Recommended) Specify if the captured image should be resized before it is saved to the List (if it exceeds the maximum allowed size). Specify the policy for resizing the image. Choices include Always, Only If Image Exceeds Max Size. The image will always be resized, regardless of its raw size. The image will only be resized if the raw image size exceeds the maximum size. If the image that is captured is bigger than this size, the image will be resized. Specify the image compression factor to use when capturing an image using HTML5. When the image is captured, should EXIF data stored in the image be captured? Define the type of EXIF info capture. Specify the maximum image size (in bytes) that can be captured. Set to -1 for no limit (NOT RECOMMENDED!). Specify if the image should be captured by using the camera to take a picture, or if the user should select the image from the Photo Library on the device. Choices include Camera, Photo Library. Specify if the user should select a picture or video from the Photo Library Choices include Pictures, Videos. When enabled, the image is saved to the device's photo library. Can the user edit the picture after capturing it? Image selection canceled message property. Image selection message close button property. Camera canceled message close button property.